Argentina is the second largest country in South America and extends from Tierra del Fuego to the Water Falls of Iguaçu, with 3,700 km between these two points. Endless pampas, the Andes in the west and subtropical forests in the north are characteristic of the country. The country numbers more than 30 million inhabitants and almost double this number of cattle. That’s why the “gaucho” has become the national symbol, even though 13 million people live in Buenos Aires. A majority of the inhabitants are of Euopean descent, of which they are still proud today. 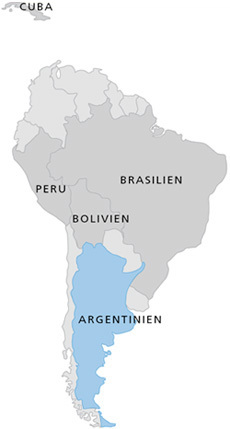 There are Indians in Misiones (Guaraní), in the Chaco (Toba, Wichí), in the Andes (Quechua) and in Patagonia (Mapuche). As the other Latin American countries, Argentina fell under the religious supremacy of the Catholic Church. The Amerindians, too, had to bow to the “Conquista”. Under the varnish of the Catholic Faith, however, numerous traditions dating from pre-colonial times kept alive. With the immigrants from Central Europe in mid-19th century, the Protestant churches appeared, which at first were merely immigrants’ churches. In the 20th century particularly, mission churches of many denominations grew in number and importance. MASA’s partner in Argentina is the Asociación Germano Argentina (AGA), which has emerged from the former German Association of Argentina. In recent years, we have increased our missionary efforts among the descendants of the Central European immigrants. There have been powerful and profound conversions, which have motivated us to expand the work.